Animal breeding is not exact science in the sense that normally one cannot exactly predict the outcome, or even select the "ingredients". Each gamete (an egg cell or a sperm) is different, and their combination and further cellular divisions all include an effect of randomness. So each breeding scheme has risks. This post will address some of those risks and how to minimize their impact. Breeding always requires some inbreeding. This is because we want to increase the genes from one or few excellent animals, so we use them for males/females of several generations. Consider horse racing and show jumping: it's common to list the famous parents, siblings, half-sibs and grandparents of any horse to prove its value. Inbreeding works in two ways: inbreeding increases variance between lines/populations, but decreases variance among a line/population. Remember that inbreeding depression, the negative effect of inbreeding on genetic diversity, can be negated by breeding two animals of completely different lines. Both agenomic selection schemes (GS) and progeny testing schemes (PT) have their own risks. Professors Alban Bucket and Jarmo Juga from the University of Helsinki have studied the risks in bovines. They state that in GS schemes the rate of inbreeding is slightly higher than in PT schemes, but reciprocally the genetic response is much higher in GS than in PT. The choice becomes a matter of balancing the risks. How high of an inbreeding level do we accept to get strong genetic response? Bucket and Juga state that if the amount of sires is not increased, the risk is comparable between GS and PT schemes. The risk in GS can be further minimized by increasing the amount of MOET (multiple ovulation, embryo transfer) and the number of genotyped females.This increases the genetic diversity and allows effective Mendelian variance. However, increasing the amount of AI bulls in a GS scheme increases the risks of inbreeding. As has been stated earlier, selection and inbreeding impact genetic diversity in two ways: the variance between lines increases, while the variance within lines decreases. If a line equals a breed, the impact can be very strong.One example can be found from the study by Uimari and Tapio, who studied how the effective population size has changed over generations in two pig breeds. 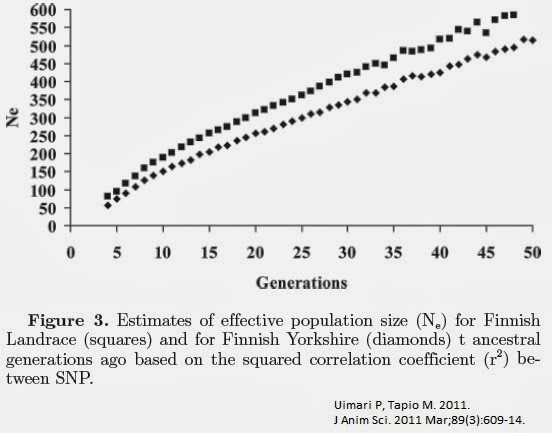 During 50 generations, selection has decreased the effective population size from 600 to a mere 50. The decrease is simply due to breeding selection. The impact of selection to the Ne of two pig breeds. 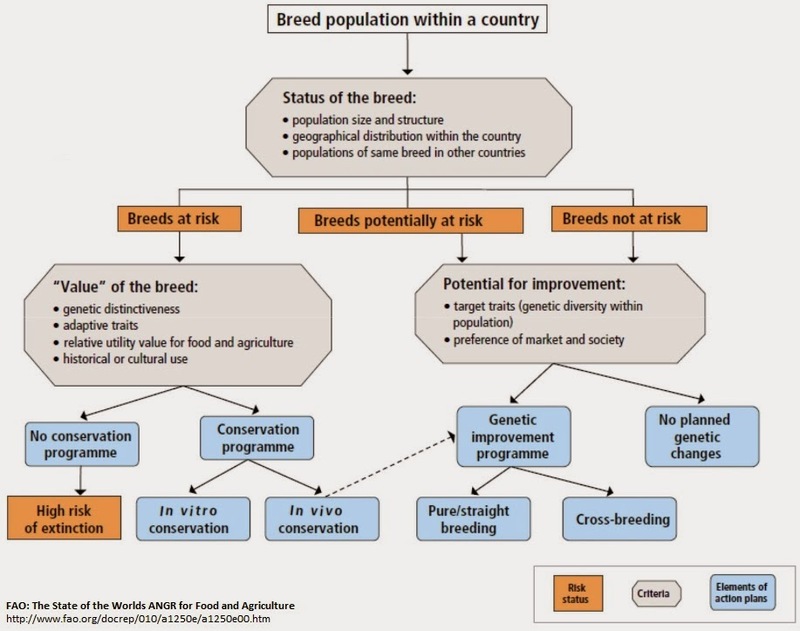 Maintaining genetic diversity should be duly considered in every breeding scheme. By genotyping a large amount of animals it is possible to ensure diversity by pairing unrelated animals. By genotyping one can also ensure that rare alleles stay in the population, and that there is enough heterozygozity. These two go often hand in hand: rare alleles are found most often in heterozygotes than in homozygotes. By genotyping one can also preserve traits of specific interest and genomically control the level of inbreeding. all it takes is the courage to look beyond monetary gain and efficiency. I really liked this article and being a medical student i found this post about animal breeding really interesting. Impatiently waiting for more updates!